We offer a range of unique rooms at our hotel in The Rocks. From small and cosy rooms with a shared bathroom to spacious and airy rooms with private ensuites bathroom, each room has the character and classic boutique style of The Russell Boutique Hotel. Our larger rooms are complete with ensuite bathroom and air conditioning they are perfect for a longer stay or if you are wanting more comfort, while our cosy standard rooms with shared bathroom are an ideal budget option for a short stay.  In addition to our convenient location in Sydney and our homely rooms, all guests at The Russell Boutique Hotel have access to our guest sitting room and private rooftop courtyard garden. Also included is complimentary continental breakfast daily and free Wifi throughout the property. Our unique accommodation offers a beautiful rooftop garden which is the perfect vantage point to look out towards Circular Quay. You can also relax or plan your day in our Sitting Room which boasts a library, laptop and games for you to enjoy. Our two on-site bar and restaurant dining options provide our hotel guests with the perfect place to eat and relax before or after a busy day exploring The Rocks and Sydney. They offer classic Australian wholesome meals and a great selection of beers, and delicious cocktails. No two rooms are the same - we offer a range of unique rooms at our accommodation in The Rocks. From small and cosy to spacious and airy, each room exudes the character and classic boutique accommodation style of The Russell Boutique Hotel.